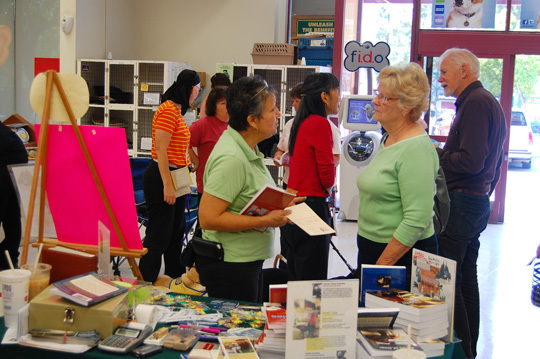 Day 2 was PetCo, LaMesa. Manager Amy had us stationed right in front where customers coming through the doors couldn’t miss us. Pat Salzarulo knew Nathan and I were exhausted, so she told us to get some rest; she would take care of everything. “Just show up at noon,” she said. By the time Nathan and I walked in at noon, Pat had already been there for an hour. 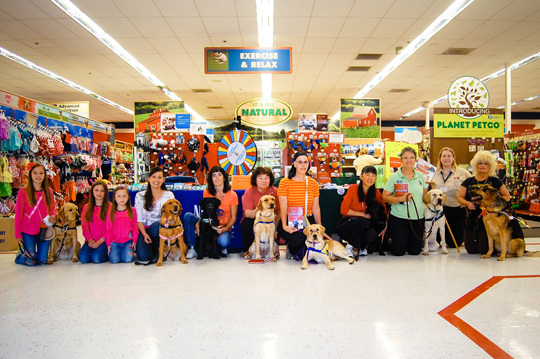 On the long table were books and brochures from both Canine Companions for Independence (CCI) and Guide Dogs for the Blind (GDB), GDB luggage tags and bumper stickers, “Wag more, Bark less,” and little packets of tiny bone-shaped candies. Debbie Kraimer had made a big poster showing the cover of A Gift of Puppies along with cut-outs of all the contributors featured in the book. It was quite an array. Once more, Pat had invited friends with pups from CCI and GDB. She knows them from Love on a Leash — a group that takes various kinds of service dogs to bring comfort and cheer to people in hospitals, jails, nursing homes, etc. It was a treat to have three hours to see all the different dogs who came through the big glass doors at that popular PetCo. It was like being at a dog show. 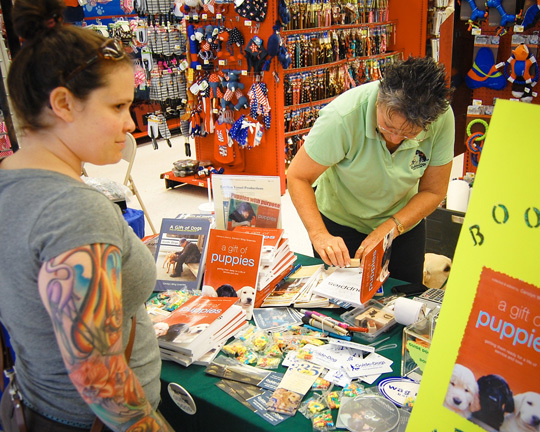 We talked to customers, answered questions, and passed out information on service dogs. I also had a chance to talk to the CCI raisers. Janis turned out to be vegan, so we swapped recipes and shared stories. What fun! I told Pat not to expect to sell any books. This was not Barnes & Noble. People don’t come to PetCo to buy books. I was wrong. Pat is one persuasive gal. Some people have a gift of talking to strangers. One of the people who came to the event stayed around to help pack up the stuff afterwards. Her name was Suzie Hays and she had met Pat at the vet’s recently when Pat took one of her dogs in for a check-up. Pat and Suzie were so comfortable around each other and worked so smoothly as a team that I thought they’d been friends for years. 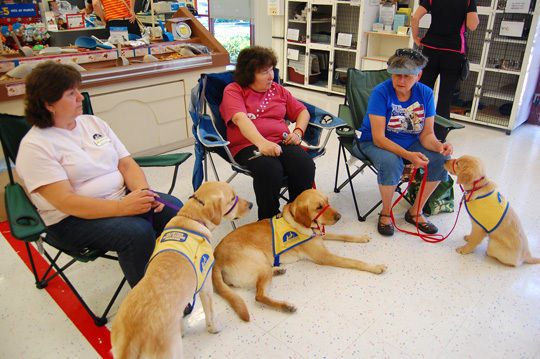 Suzie had invited a friend, a lovely woman named Eileen, who recently graduated from GDB with a yellow Lab named Ventura. Eileen asked me if the books were in braille. When I said I didn’t know how to get that done, she suggested I talk to the people at the Braille Institute. She volunteers there teaching gardening. Eileen said she knew a lot of people there and would call them on Monday to see if we could talk with someone about having my books transcribed into braille. I was thrilled. Eileen said she would call me and let me know what she found out. How exciting! And at PetCo, no less! What would Eileen find out on Monday?